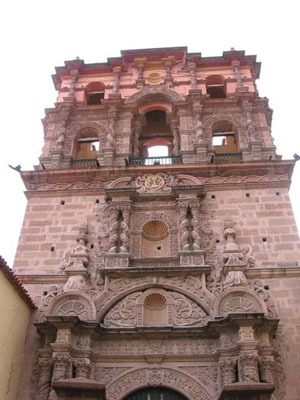 The former Compañia de Jesus church is one of Potosi's many examples of Mestizo religious architecture, a style which marries traditional Bolivian with colonial Spanish influences. Of particular interest are the fine details of its intricate bell tower. In recent years, the ground floor of the church has been transformed into an 'InfoTur' tourist information point. They have detailed maps and information on the city and its sights. For a small fee, visitors can climb the bell tower. The views of the city are pretty spectacular and it is the best way to enjoy the full impact of the Cerro Rico.